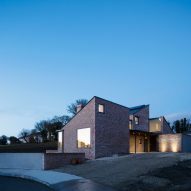 Scullion Architects has built an L-shaped brick house with sloping roofs on the outskirts of a seaside village near Dundalk, Ireland. 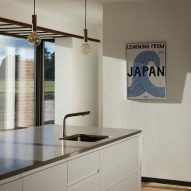 Embedded in a meadow, Blackrock House is home to a retired couple who wanted a low-energy home with plenty of natural sunlight through the day. 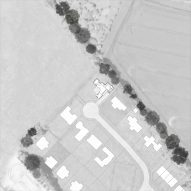 Scullion Architects designed the house as a series of volumetric forms that refer to the surrounding local farm buildings, which are characteristically added to over time forming a "conglomerate larger whole". 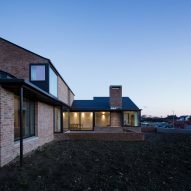 The single pitched roofs fan out from the central patio, with the higher elevation extending towards a row of recently built adjacent houses. 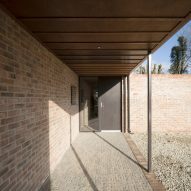 In the predominantly red-brick town of Dundalk, Blackrock House uses a subtly lighter brick to complement the earthy palette of the meadow. 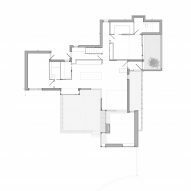 The three-bedroom house occupies the end plot of a housing development built on the outskirts of the town. 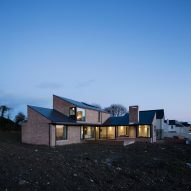 "When they purchased the site, we walked the field with them to identify where the natural position for the house would be," said Declan Scullion, founder and director of the Dublin-based studio. 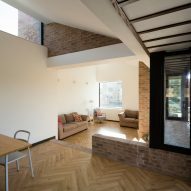 "The project was born conceptually when we levelled a square terrace on the site plan which by virtue of being positioned midway up the slope was half-embedded in the slope at its top northern end and half-elevated at its opposite southern end." 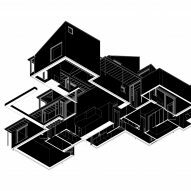 Arranged around this patio, the house's L-shaped layout is designed to fit within the meadow's sloped side. 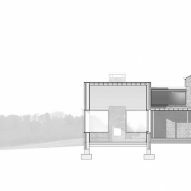 The stepped ground floor mirrors the topography, descending to create a partly sunken living room with a central fireplace. 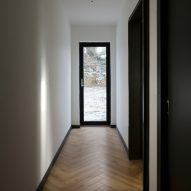 The house's varying levels allow the owners to look out on the surrounding area, with sliding glazed doors in the living room giving uninterrupted views towards the meadows. 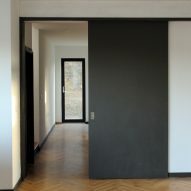 In contrast to the open living-spaces, the master bedroom on the ground floor is designed for privacy. 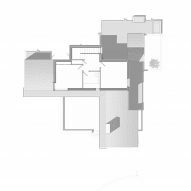 The bedroom has a large clerestory window and opens out to a walled garden, which gets sunlight from the early morning to afternoon. 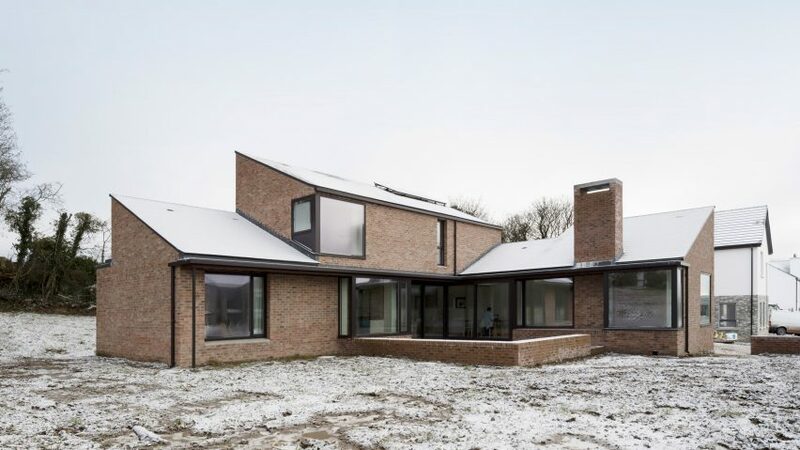 The house's insulated fabric, flush brick mortar joints and triple glazing ensure low energy consumption all year round. 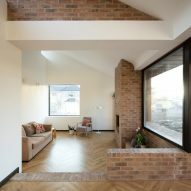 Scullion Architects previously renovated a Georgian property to create a light-filled "upside-down house" near Dublin's dockyards. 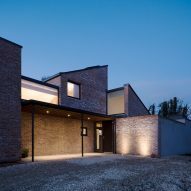 Other new residential projects in Ireland include a heritage-protected house extension built from reclaimed brick. 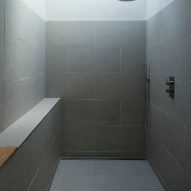 Photography is by Aisling McCoy unless stated otherwise.